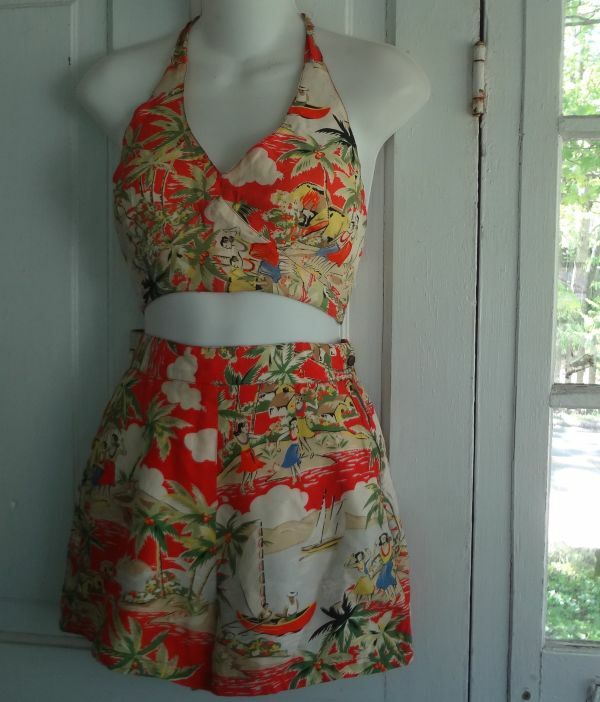 This recently acquired halter and shorts set sent me down a rabbit hole of Hawaiian textiles. 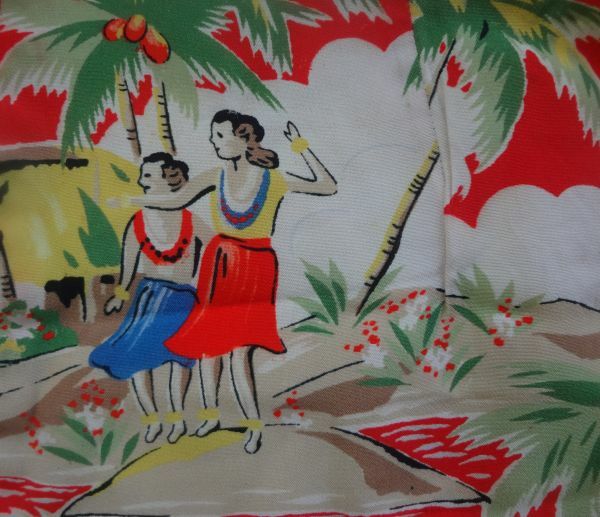 The beginnings of the Hawaiian shirt are a bit obscure, but the first ones were probably made from silk fabrics from Japan in the 1920s. Most of them were made by small shops in small batches. 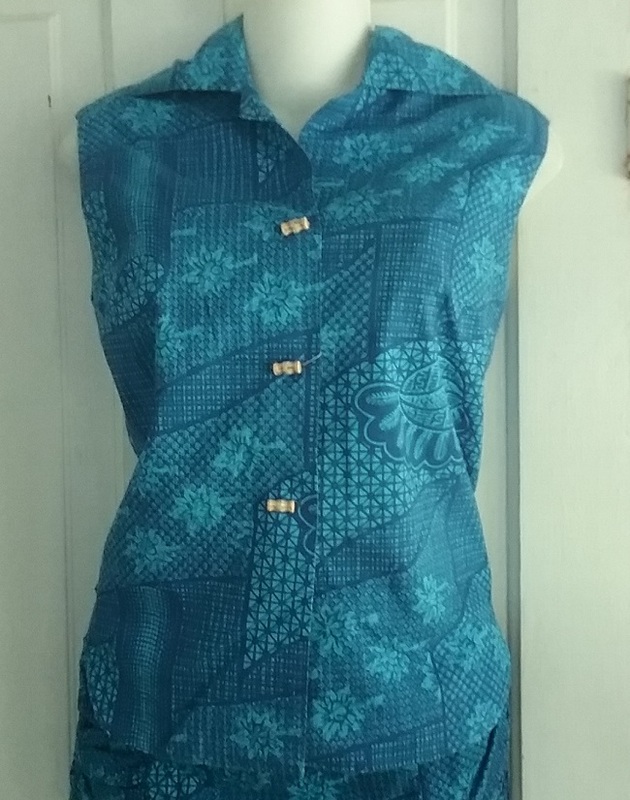 The large scale manufacture of shirts from Hawaiian fabrics started in the mid 1930s. 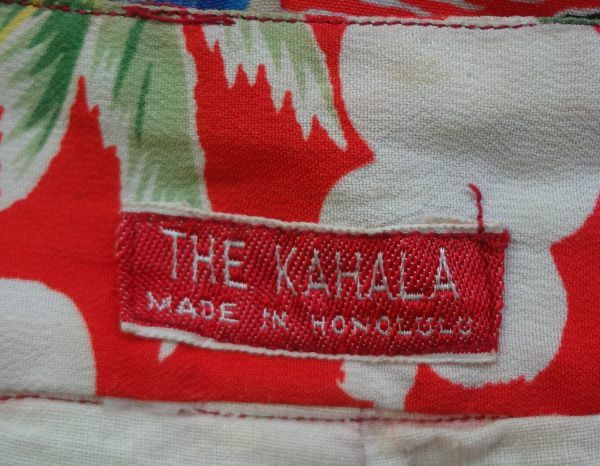 My set was made by Kahala, one of the first companies to manufacture “Hawaiian” garments. 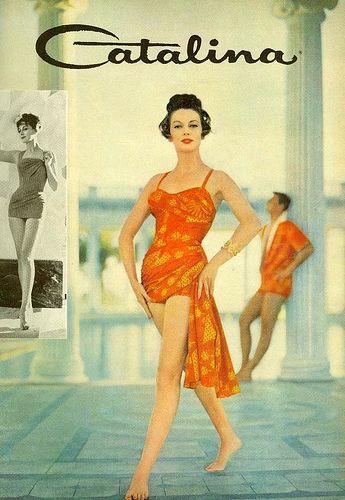 It was started in 1936 by Nat Norfleet and George Brangier, neither of whom was a native Hawaiian. Their company, Branfleet, was using the Kahala name and label by 1937. 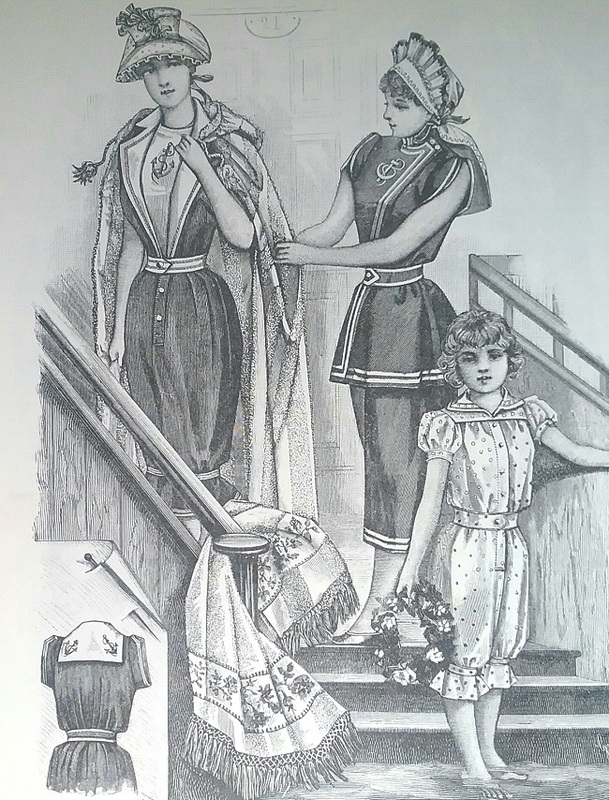 From what I’ve been able to find out, women’s garments were not made until after World War II, but then clothing for women became a major part of their business. 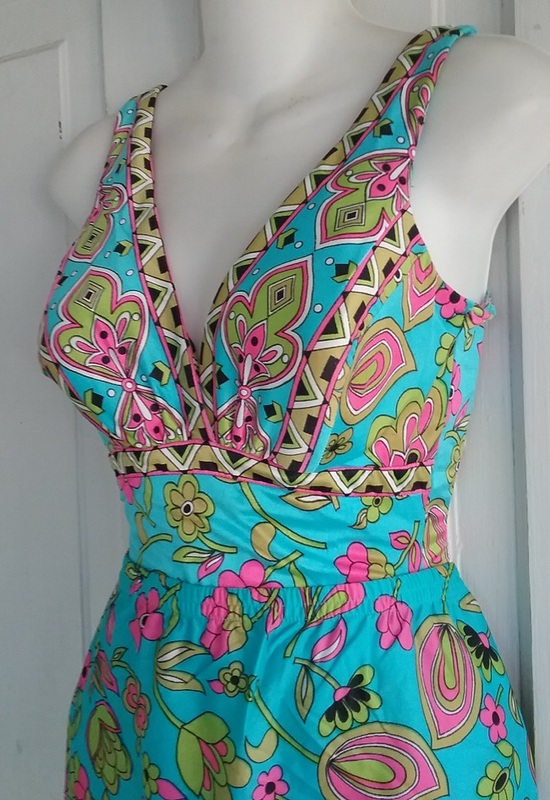 It is possible that my set is actually a bathing suit. 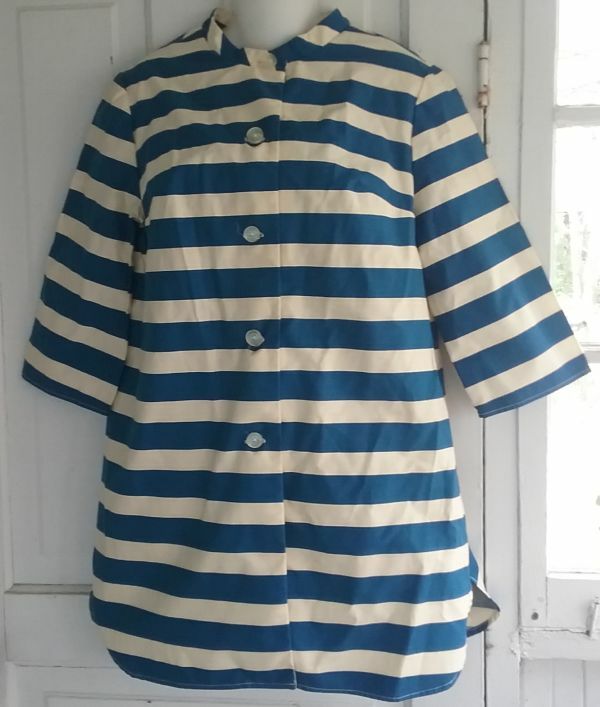 It is completely lined in cotton jersey. 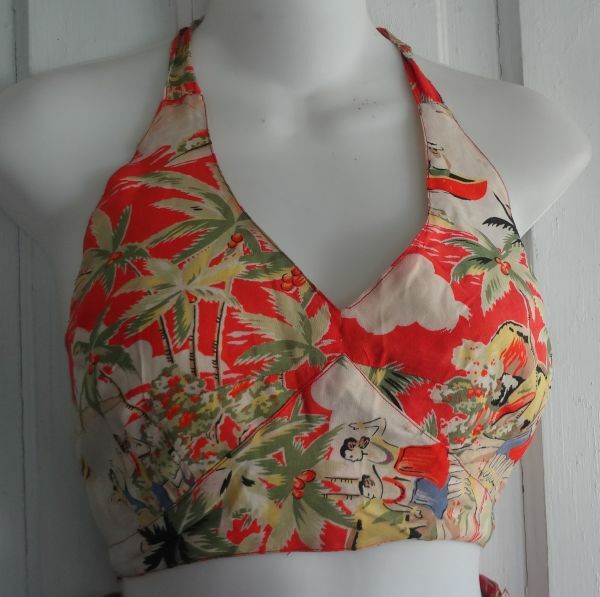 What Norfleet and Brangier discovered was that men would buy a shirt made from their Hawaiian fabrics to wear while in Hawaii, but women would continue to wear their Kahala garments after returning home. 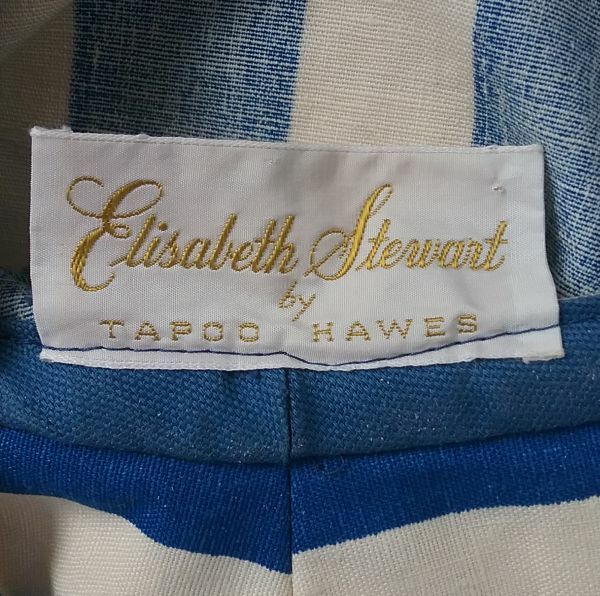 I’d say this was much better than today’s not so subtle brag of the souvenir tee shirt. 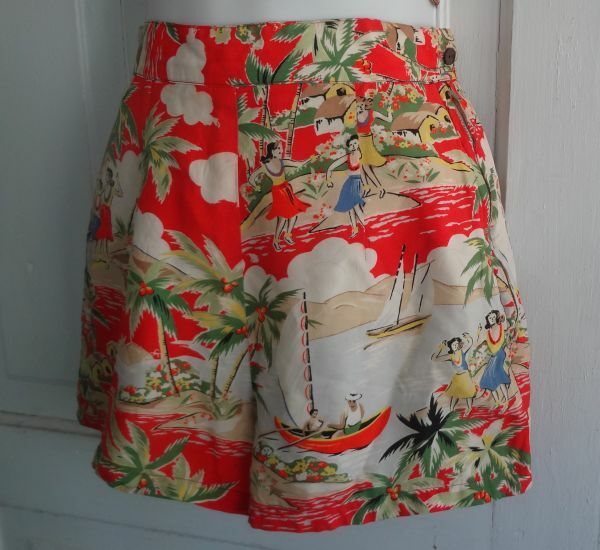 You could remind the neighbors of your Hawaiian trip while looking fabulous. 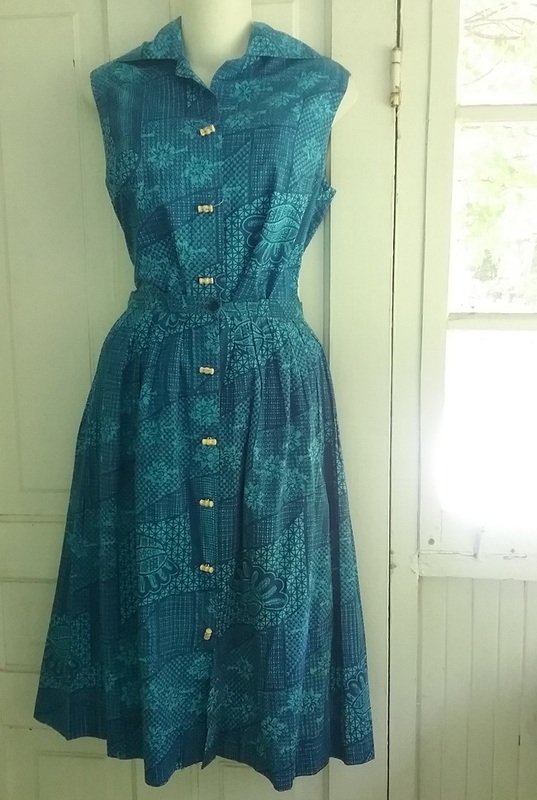 I don’t find a lot of older Hawaiian garments here in the Southeast. People here were much more likely to vacation in Florida, or if a little more affluent, Cuba. 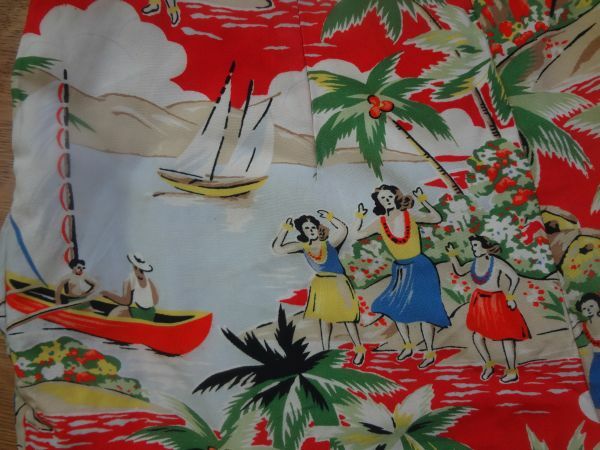 But from the few older Hawaiian shirts I have been able to closely examine, I can tell you that the fabric is very different from the newer rayons made in the 1980s up through the present time. 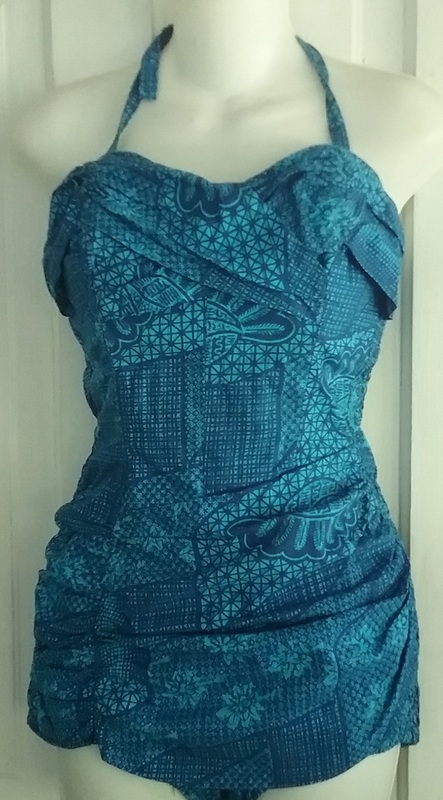 My set is rayon, but it is lightly textured, though smooth at the same time. 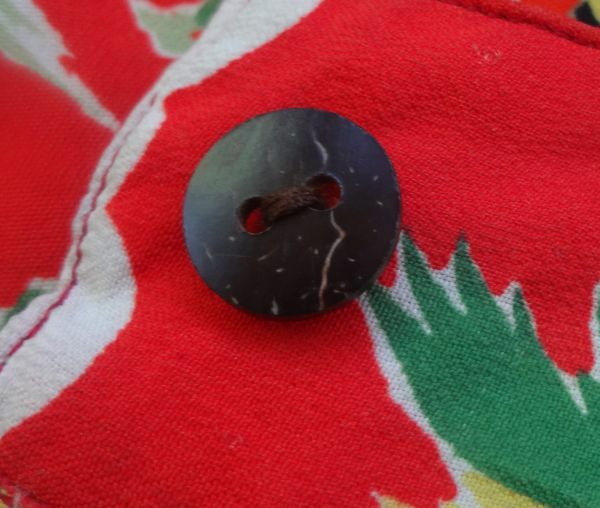 The button is made from coconut shell, and adds another layer of Hawaiian authenticity. 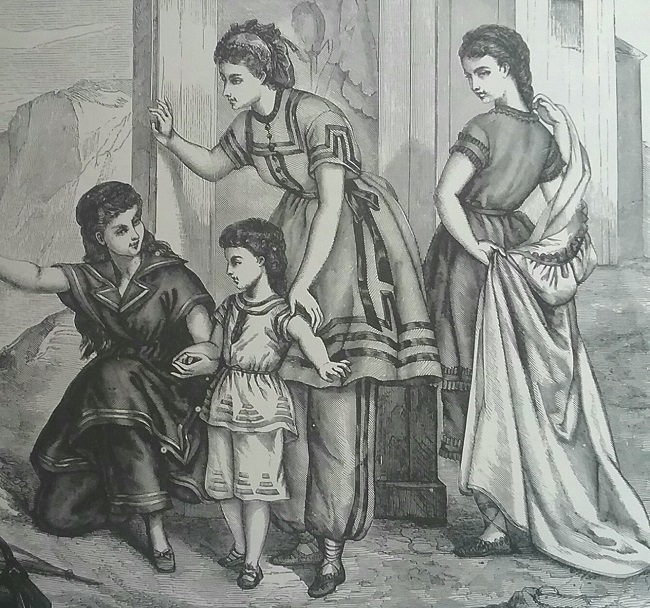 But the star of this set is the print. The richness is achieved with the use of at least fourteen colors. I especially love the light blue used with so much red. 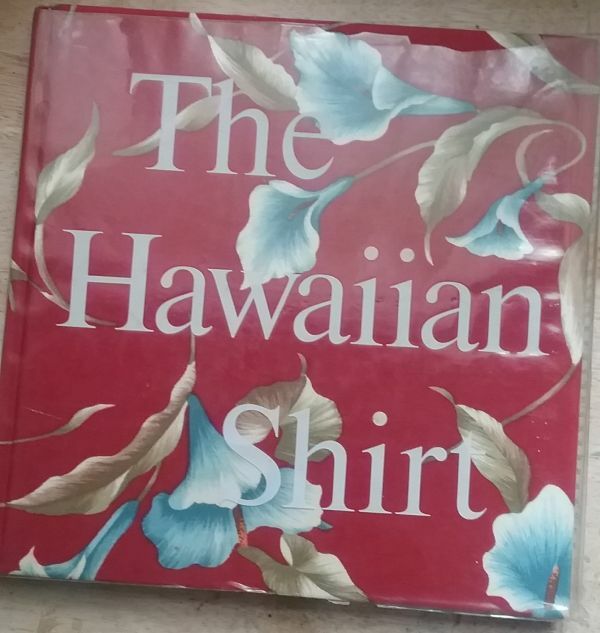 According to my one and only book on Hawaiian shirts, the very earliest prints were tropical flowers and tapa cloth prints. Scenics like mine soon became popular as well. 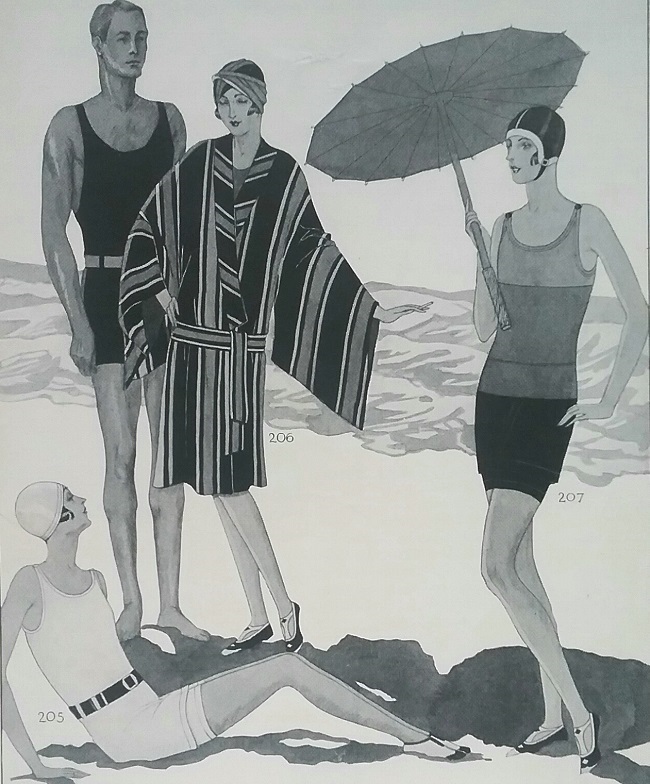 The Hawaiian Shirt, by H. Thomas Steele, was one of the very first fashion books I bought. I can remember looking through it in the local B. Dalton book store and trying to justify the purchase. It was published in 1984, so I’m sure it was shortly after than that I added this to my very small, but growing, fashion history library. 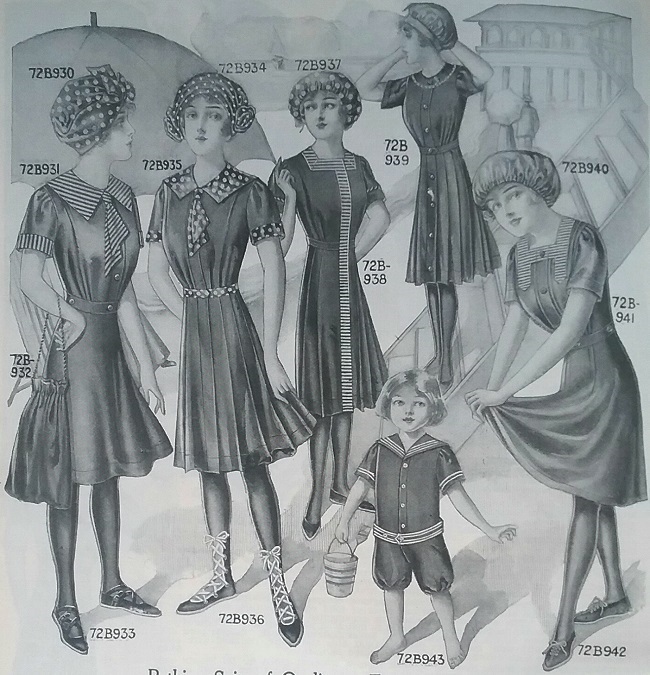 The great bulk of my collection dates after 1915, but I’m slowly educating myself about earlier sportswear, and I’ve begun to acquire a few pieces. 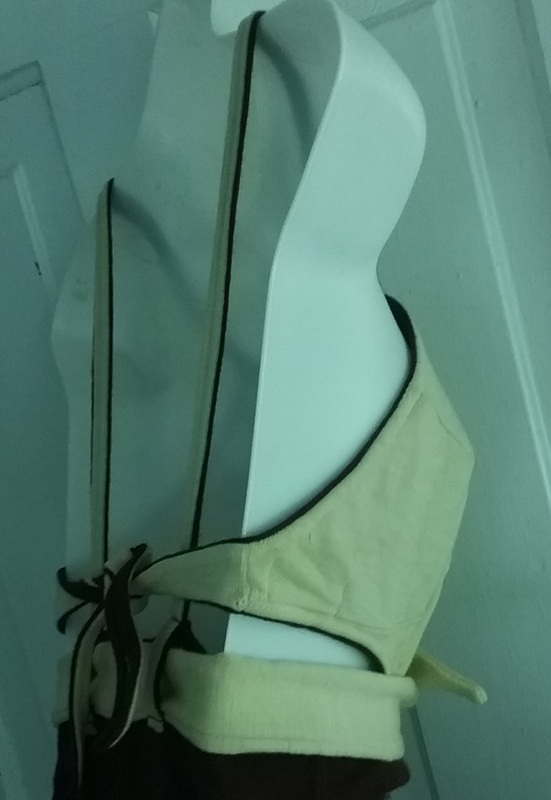 This late nineteenth century bathing suit is my latest. 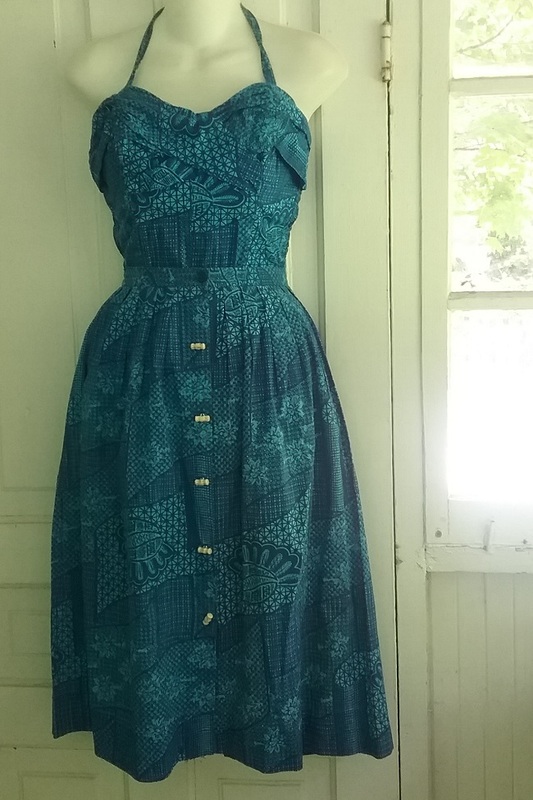 I bought this one mainly because most of the ones I’ve looked at over the past year are black, so a different color was a plus. I’ll probably eventually buy a black one, if I find one with great design that is in good condition. 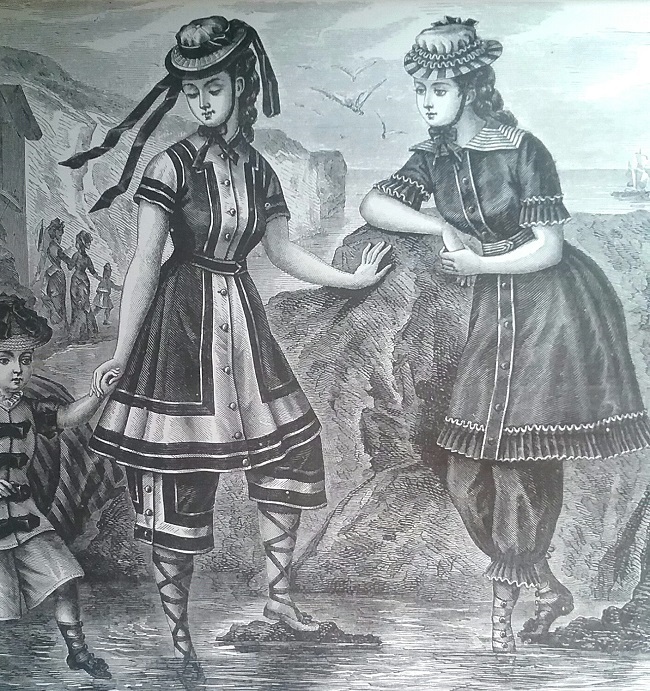 Condition is a major problem with antique bathing suits, as they were for the most part, made from wool. Besides the fact that moths love them, they were exposed to salt water and who knows what else. 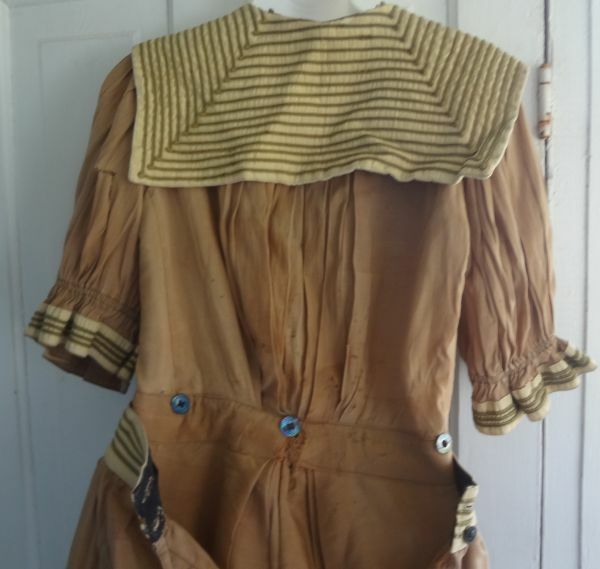 So while this suit photographs and displays well, it has the sort of issues one might expect from a well-used garment that is around 120 years old. 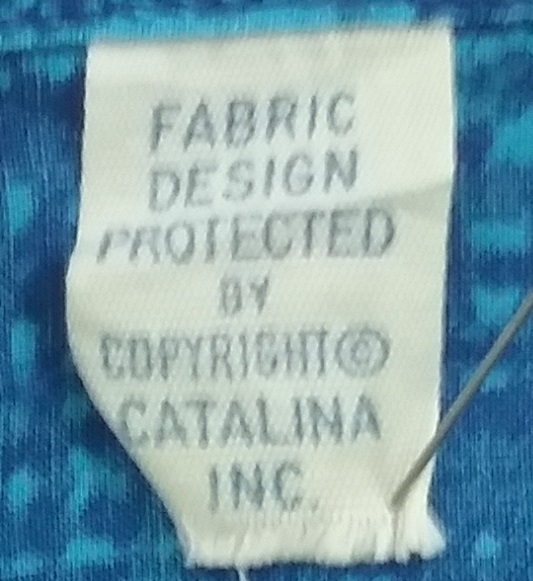 In this case, I decided I could live with more damage than I would on a more common garment. 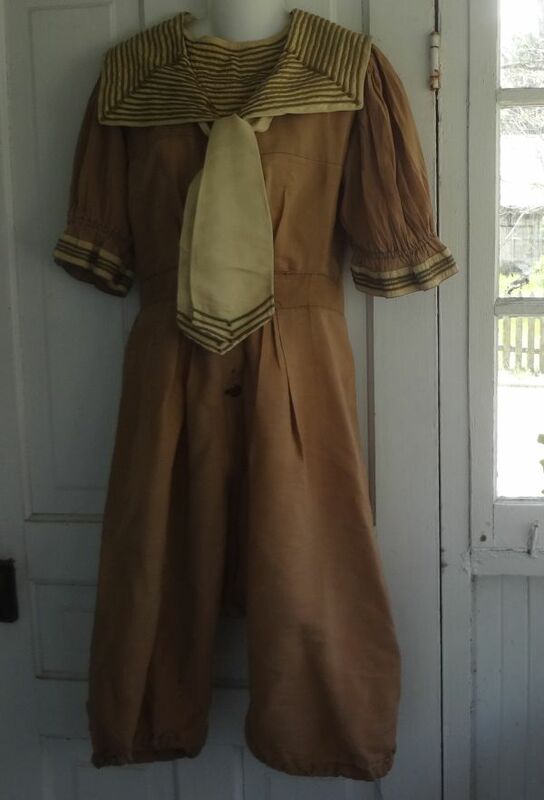 The lighter color tie is attached at the shoulders. 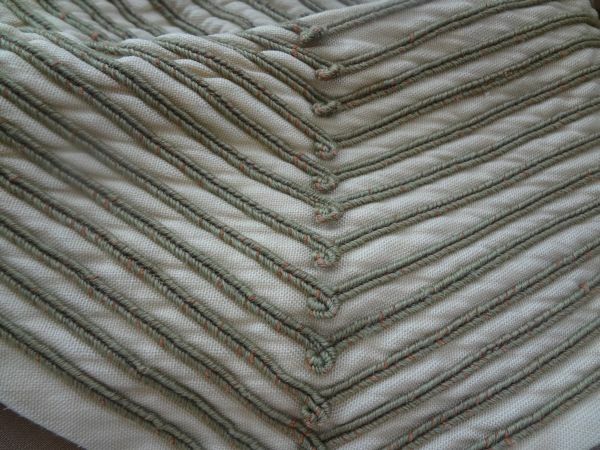 It covers a placket, under which is a row of buttons. 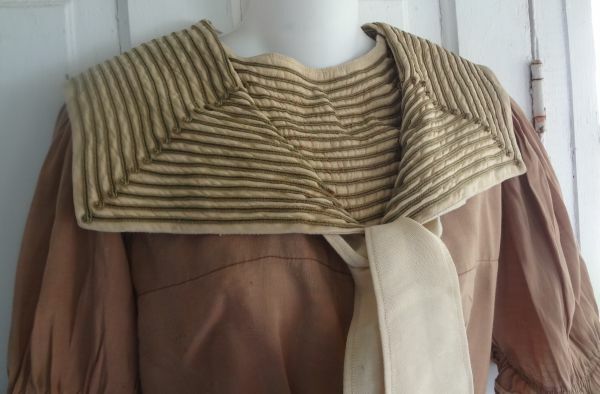 The modesty panel attaches to the collar with buttons on one side, and is permanently attached on the other. The braid, which is green, was sewn on by machine, and looks to be professionally done. 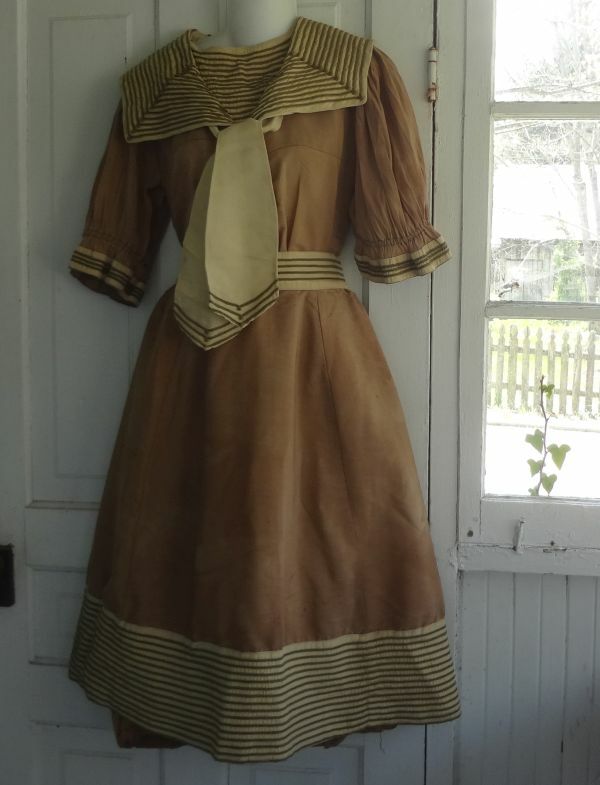 The braid also decorated the sleeves, the waistband, and the hem of the skirt. 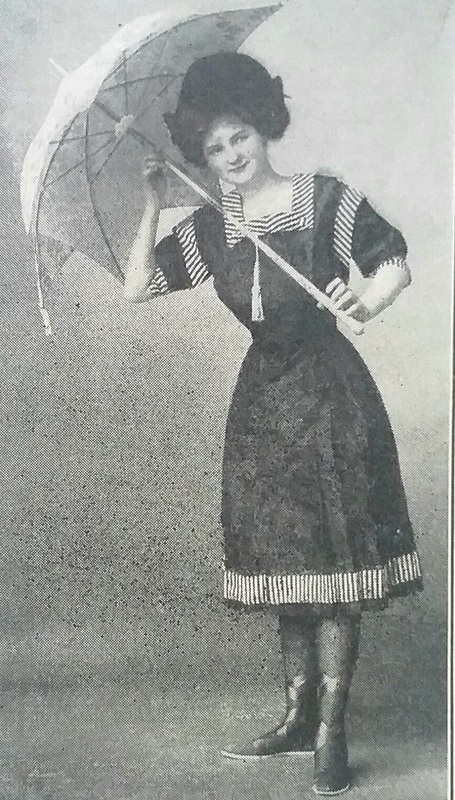 The weight of it helped to keep the skirt from riding or blowing up, thus saving the wearer from extreme embarrassment. The damage is much more apparent on the back. 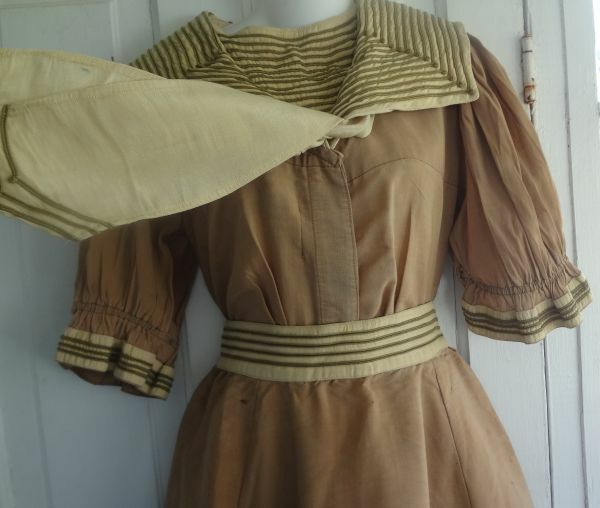 There are a number of moth holes, and the waist band is torn. I’m guessing that the owner had gained a bit of weight, and the band simply ripped from the stress. 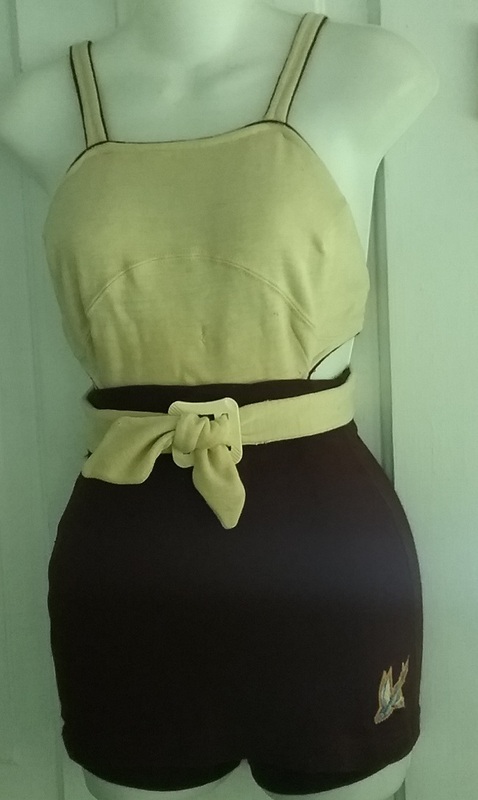 The buttons are for attaching the skirt. 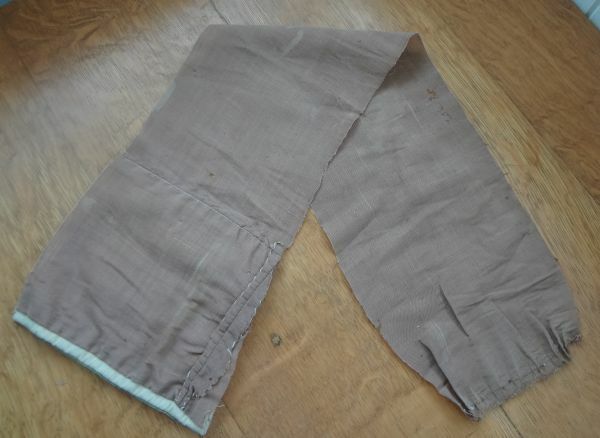 Note the fullness below the waistband, which is the top of the bloomers. I’ll get back to that in a minute. 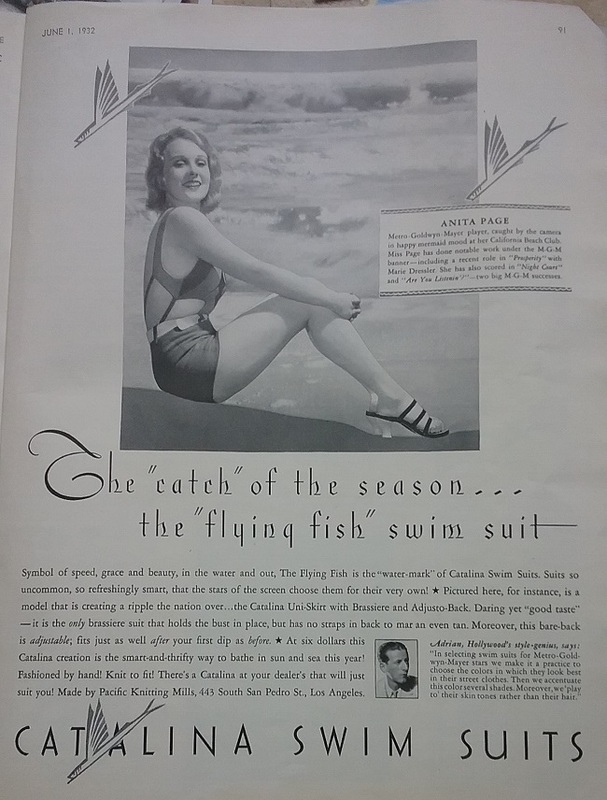 This bathing suit came with a bit of a mystery attached – an extra piece that was originally part of the garment. 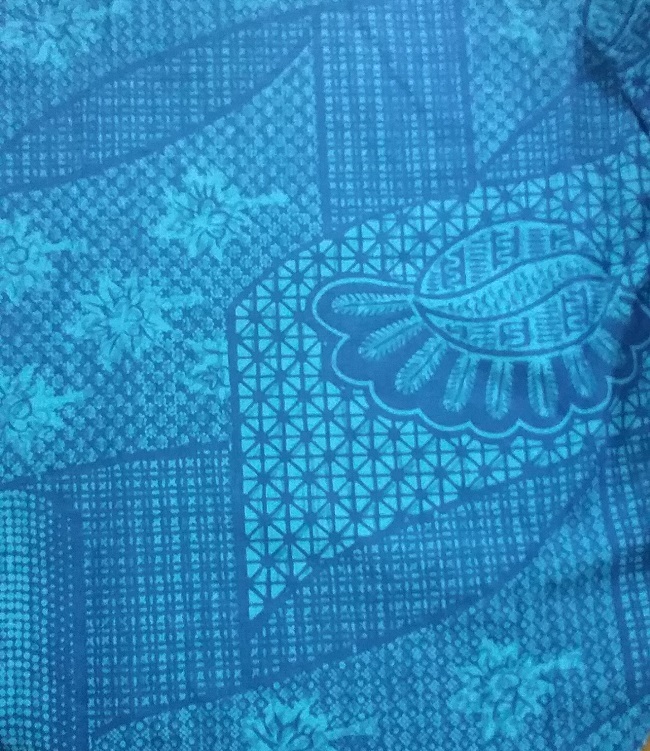 It is a slice cut from the skirt. 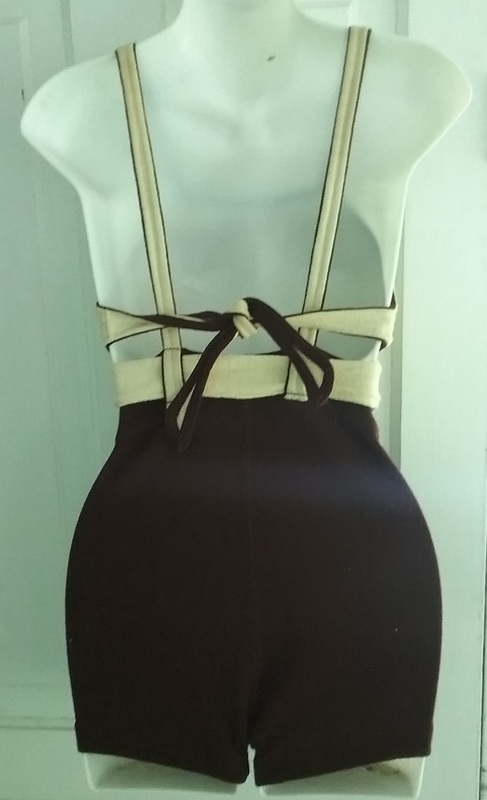 At some point the suit was altered to make the back of the skirt less full. And while there is only one piece, there is evidence that two pieces were cut out. 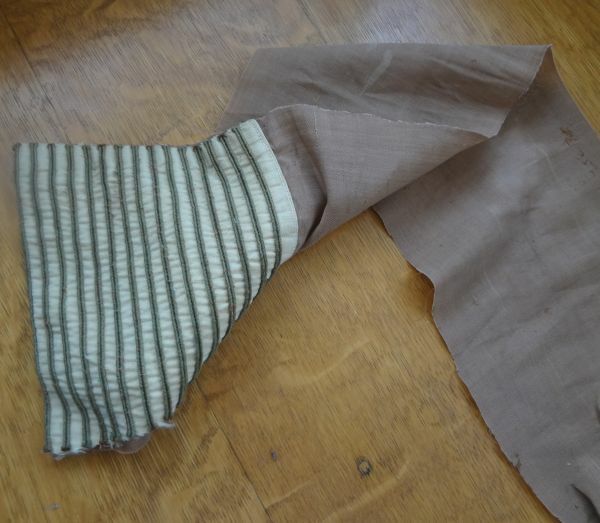 This is the inside of the skirt, showing where I think the piece was removed. 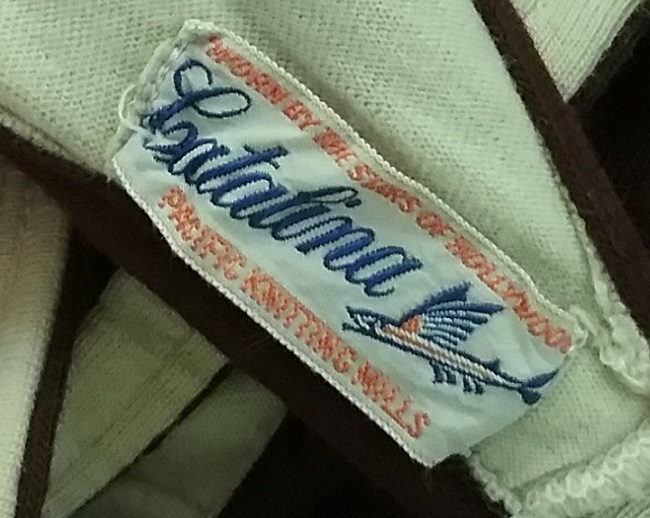 The most obvious sign is that a different color of thread was used. 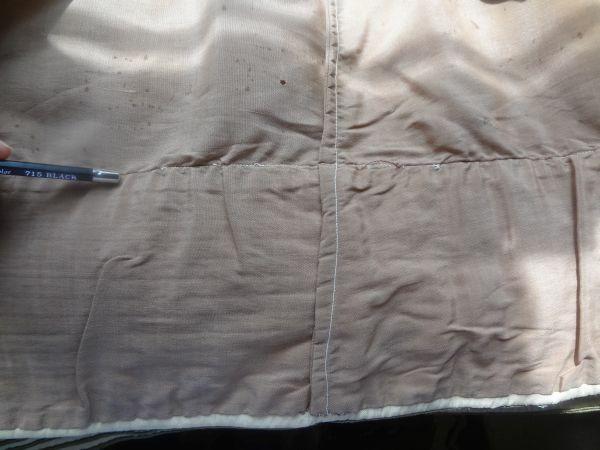 On the left you can see that the thread matches the fabric, but the newer seam is stitched in white. 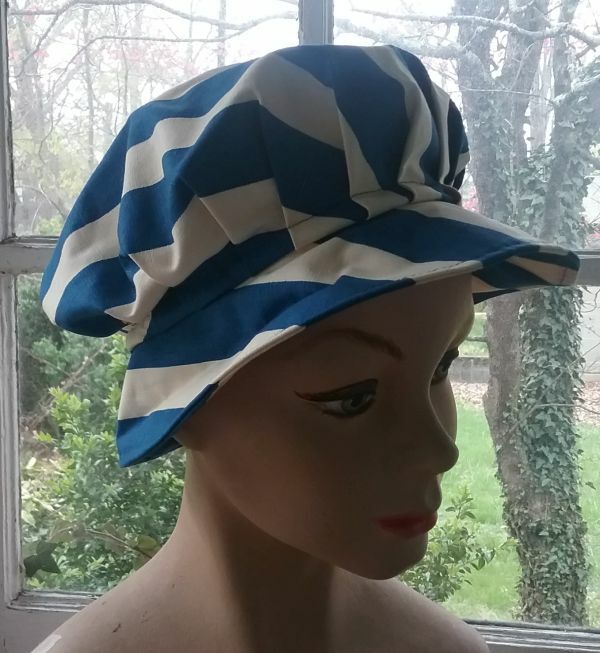 On the front, the original seams are so perfectly matched that it is hard to see them. On the two new seams, the braid is off somewhat. 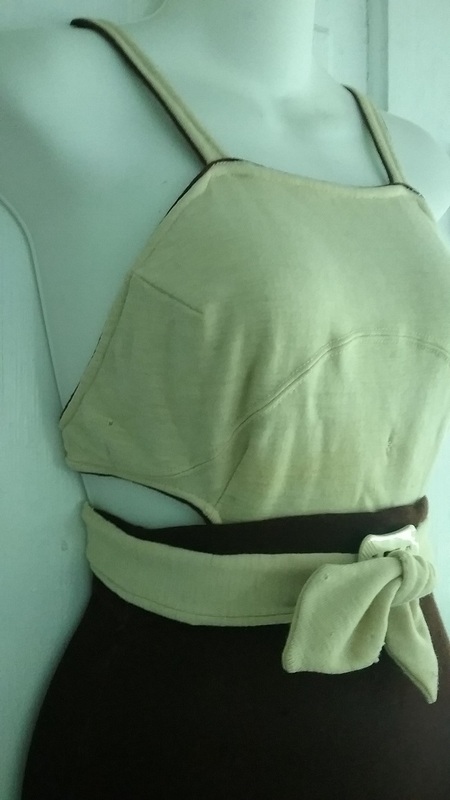 There is also white stitching where the skirt is gathered into the waistband. 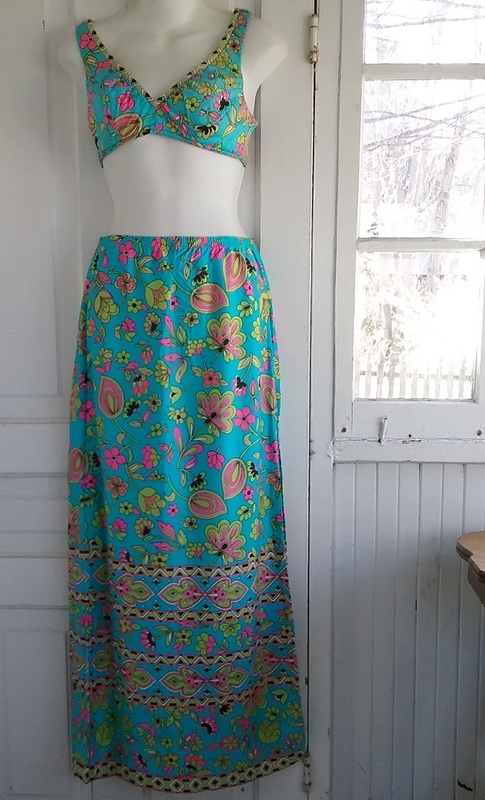 So the back of the skirt had quite a bit of fullness removed. But why? 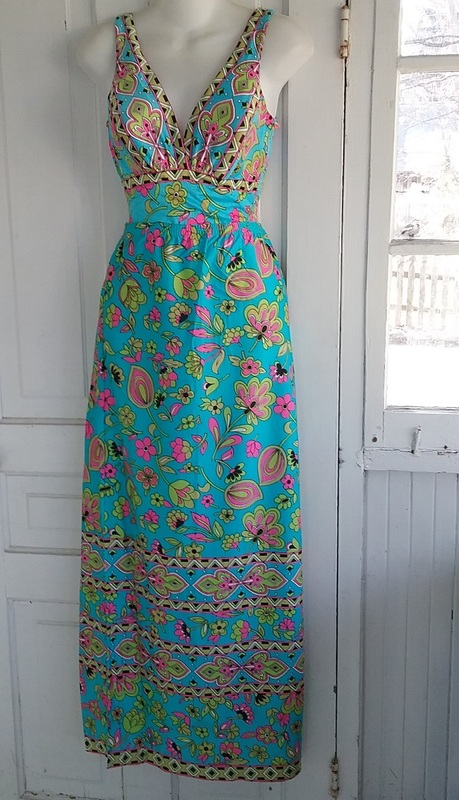 It probably has to do with changing fashion. 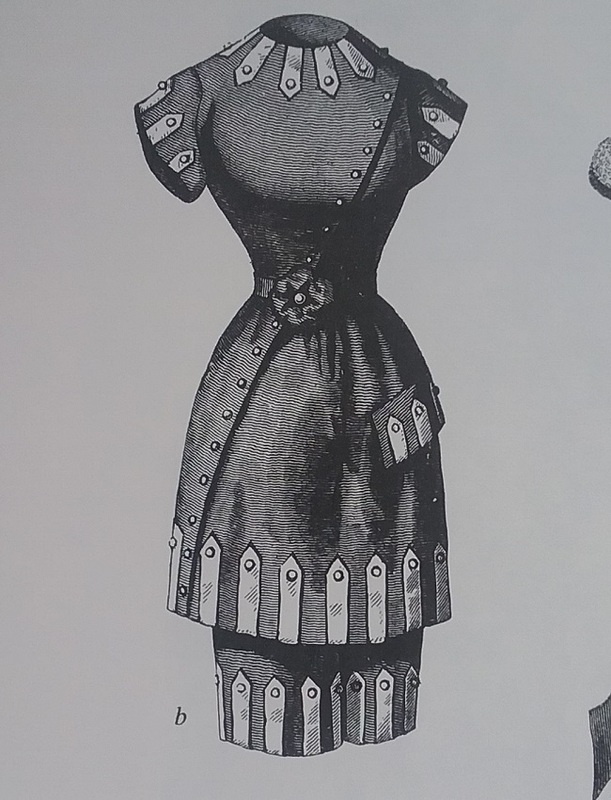 The image above is from 1898, from The Glass of Fashion. 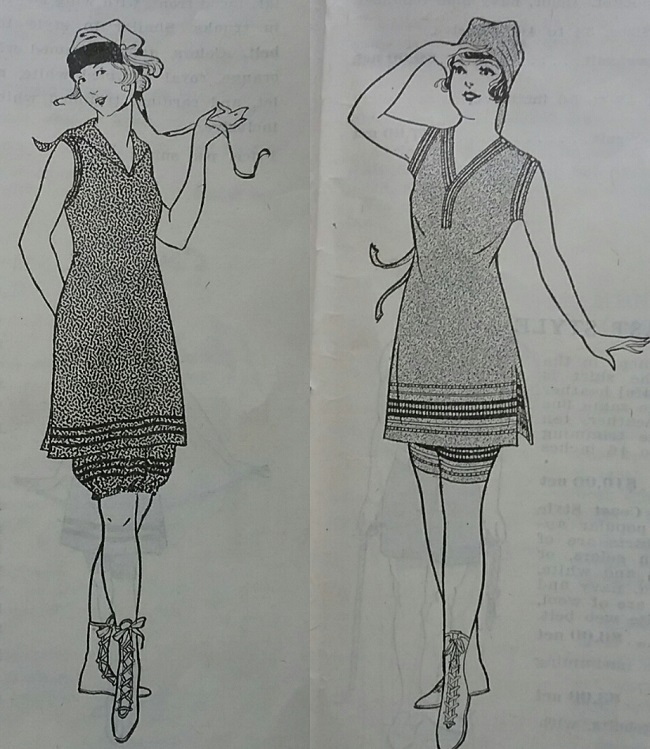 Even though a garment like a bathing suit might not be considered “fashion”, you can see the trends of an era in the shape and the details. 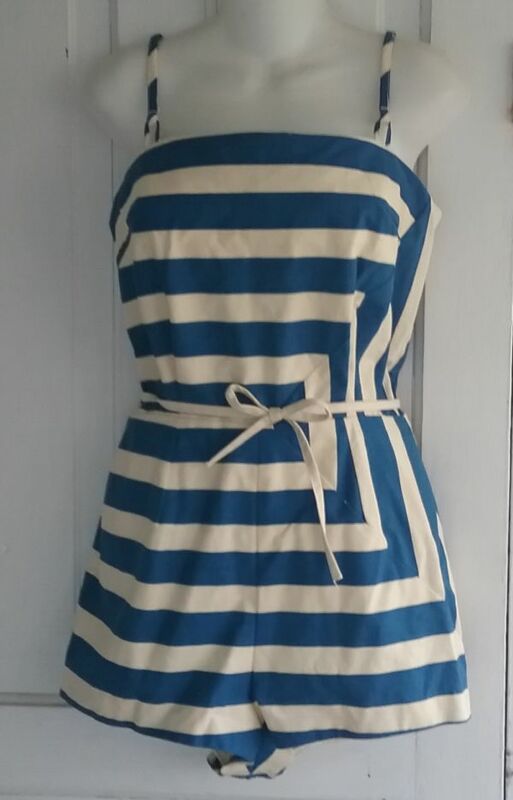 Even though this is a dress, it has a lot in common with my bathing costume, with the gored skirt having a flat front and a full back. 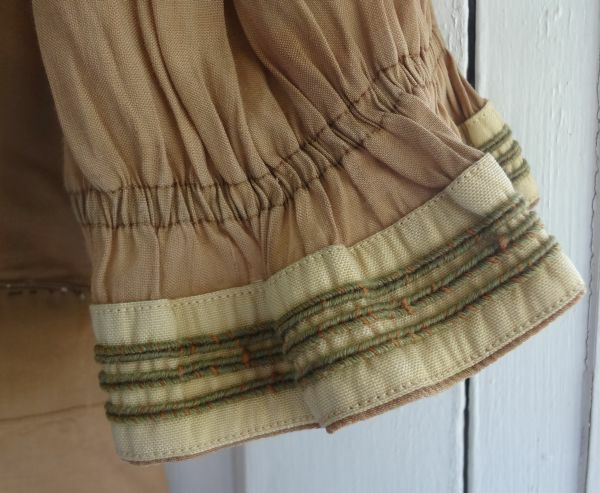 The bodice is also similar with the pleats and gathers attached to a yoke. 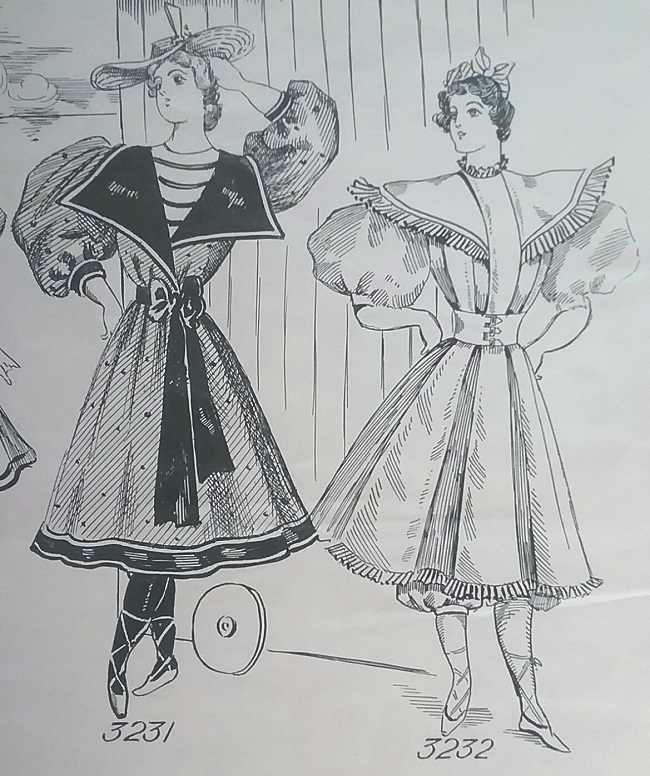 And don’t forget the puffed sleeves. 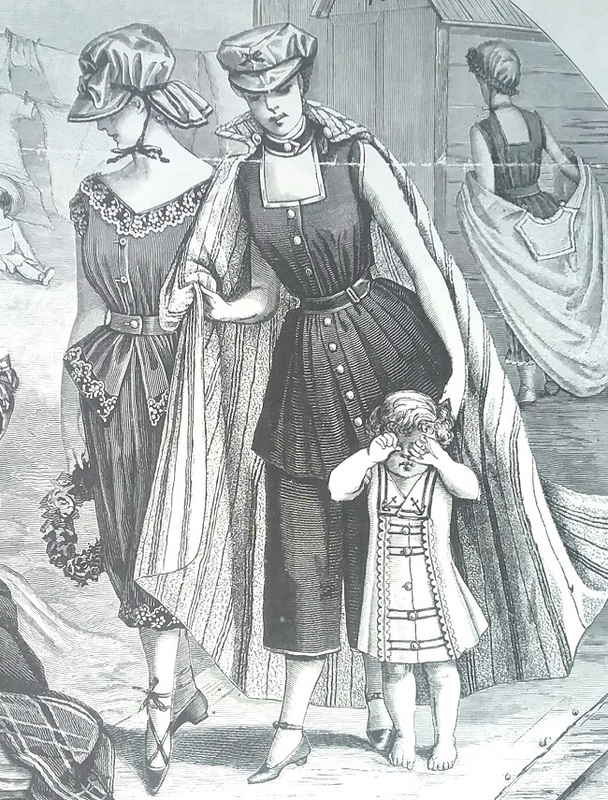 The bathing suit above is from an 1899 Delineator magazine. 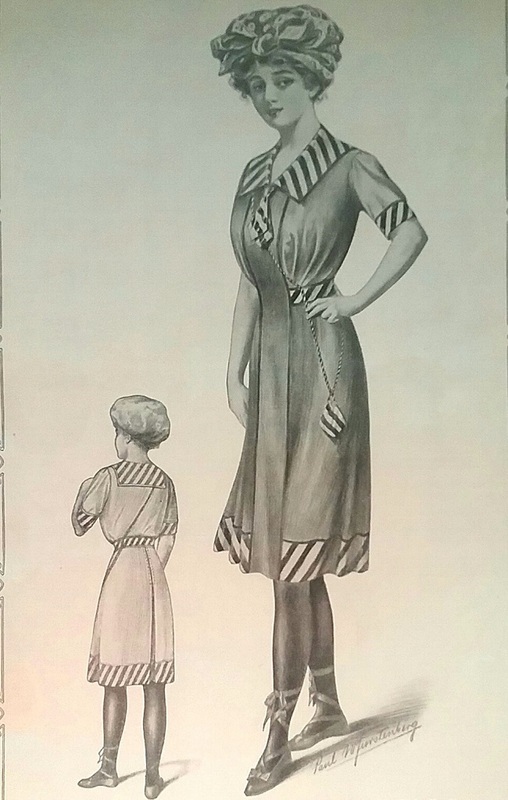 You can see how similar this one is to mine, with the tie, sailor collar, puffed sleeves and band at the hem. 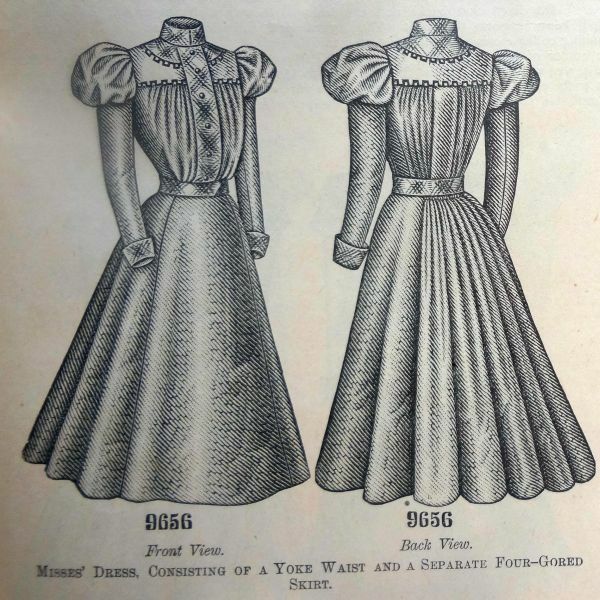 This basic style remained popular over the next fifteen or so years, with gradual changes being made to reflect changing fashion. 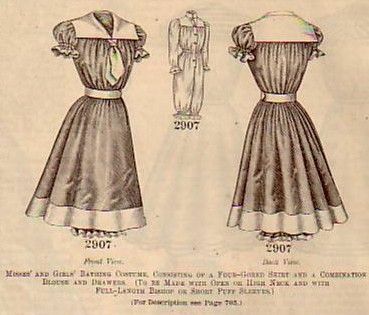 The bodice became droopy in front, the gathers disappeared and smooth, full gores replaced them. 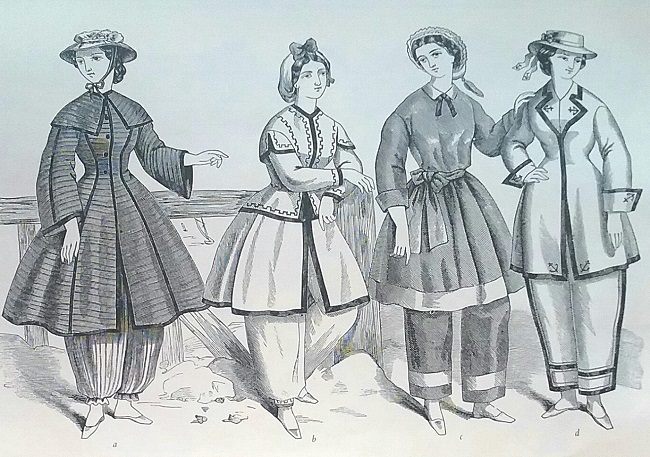 In period illustrations, bathing costumes are frequently pictured in beautiful colors, but photographs from the same time tell a different story. 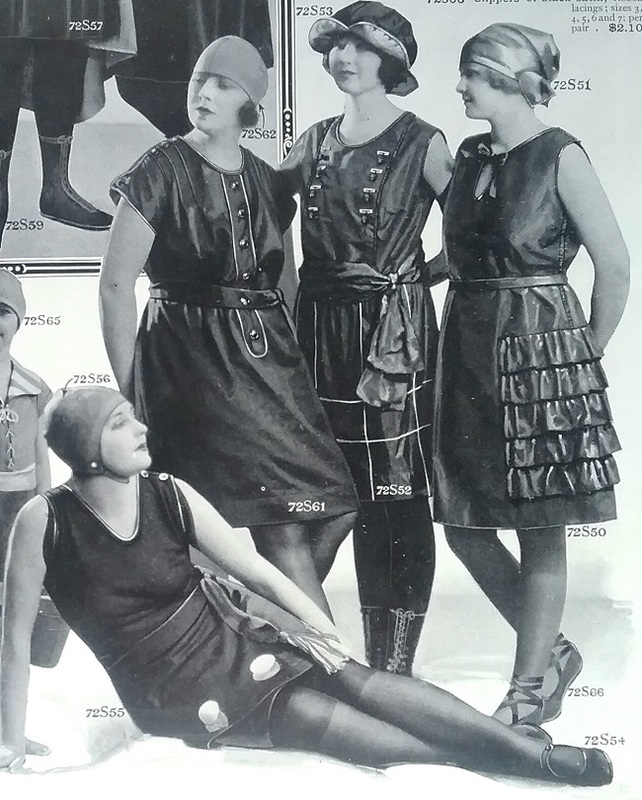 The overwhelming majority of bathing suits for women were dark, either black or navy. There are a few other problems with my suit. 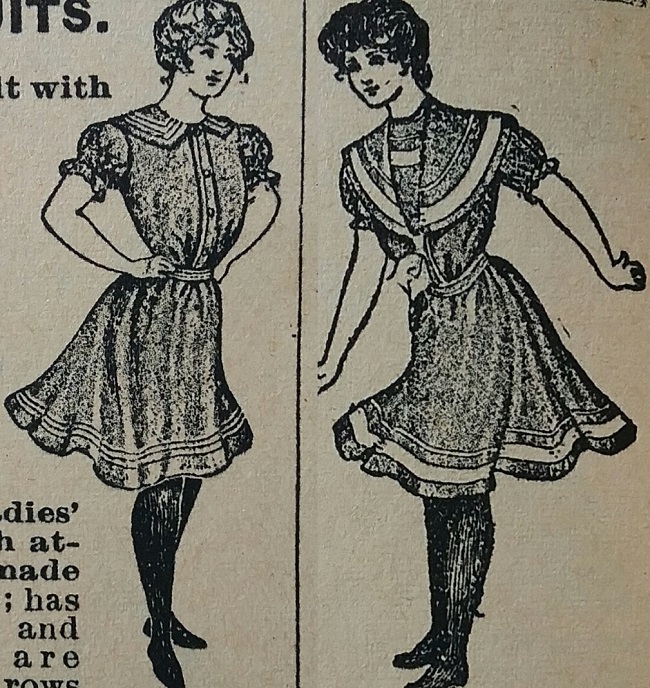 Someone shortened the waist by about three quarters of an inch by making a tuck right above the waist. I haven’t decided if I’ll remove it, but I probably will just leave it. Most of the original buttons have been replaced, but buttons of this era are easy to find so I’ll probably replace the newer ones. 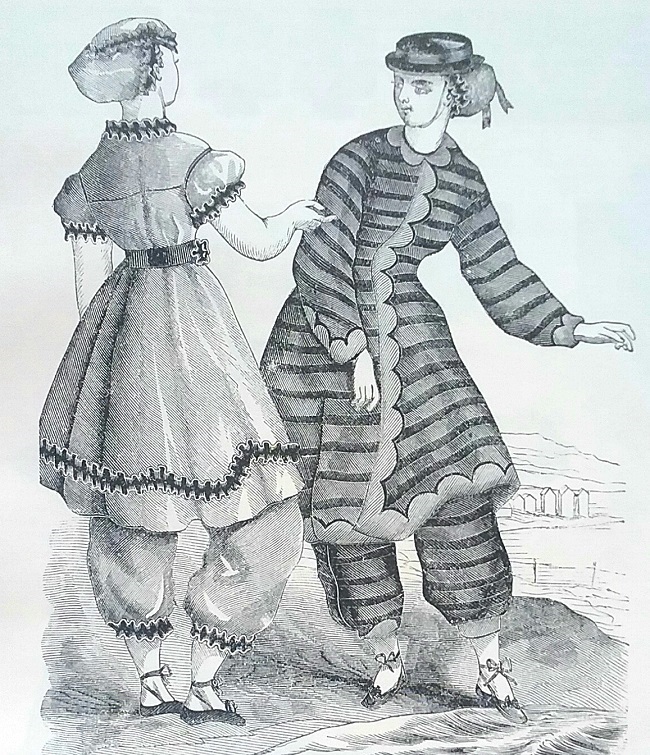 The elastic in the legs of the bloomers has completely lost its stretch. I’ll probably just leave it. It was fun analyzing this piece. 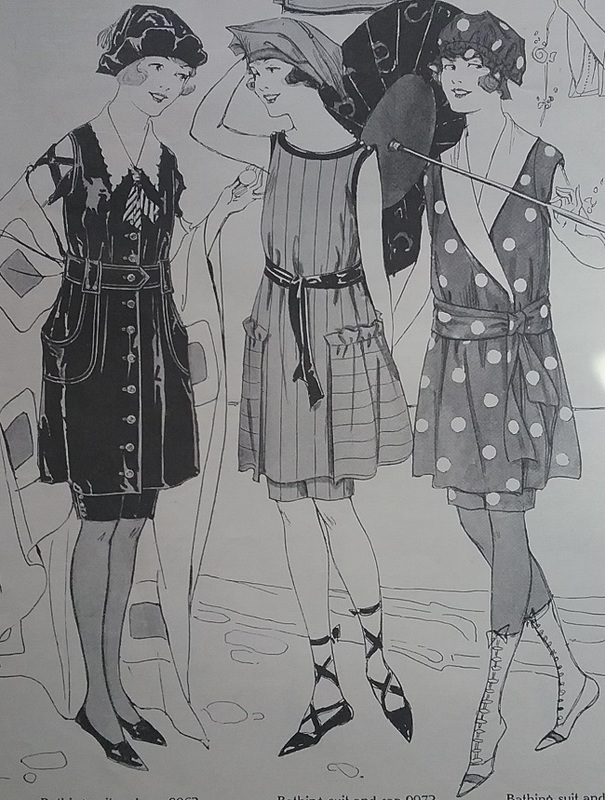 Unfortunately, I know nothing at all about who the original owner was, but I do know she had a very appealing bathing costume.